London, UK - April 12, 2019 – Motorsport Live, the events and ticketing arm of Motorsport Network, today launched the Motorsport Valley Tour for superfans seeking a first-hand insider’s view of Formula 1. The Motorsport Valley Tour is a world-first for the highly competitive, ultra-secretive world of Formula 1. The expertly-curated two-day event will give participants an exclusive behind-the-scenes experience with three leading Formula 1 teams including Red Bull Racing, Williams and SportPesa Racing Point, and a visit to McLaren. 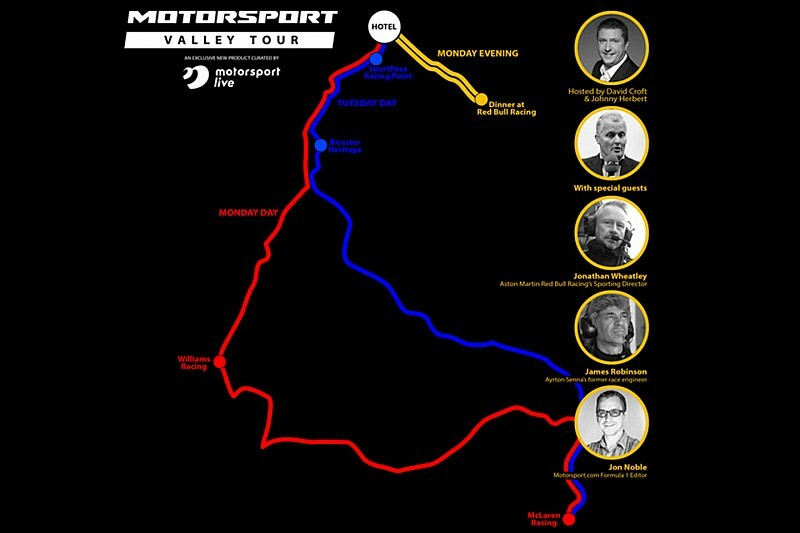 The first Motorsport Valley Tour takes place on the 15th & 16th of July immediately following the British Grand Prix. The itinerary starts at McLaren’s state-of-the-art headquarters designed by Sir Norman Foster, where participants will be invited to take part in a pit stop challenge under the expert guidance of a representative of the race team pit crew. From one legendary team headquarters to another, the tour progresses to Williams to view the world’s largest private collection of Formula 1 cars at the Williams Heritage Collection. The first day concludes with a visit to a third leading race team headquarters at Red Bull Racing, with a dinner in the heart of the team’s operation hosted by Sky’s David Croft, and former British GP winner, Johnny Herbert with expert insight provided by Aston Martin Red Bull Racing’s Sporting Director Jonathan Wheatley, James Robinson – Ayrton Senna’s former race engineer – and Motorsport.com’s Formula 1 Editor, Jonathan Noble. After an overnight halt, the tour recommences at the SportPesa Racing Point headquarters at Silverstone, with an extensive and open-all-areas tour of the manufacturing, car build and simulation facilities. The day two lunch waypoint is Bicester Heritage, a global centre of excellence for automotive conservation, engineering and development. The Bicester Heritage stop also provides an opportunity for passenger rides in a 1929 Bugatti 35B Formula 1 car. The itinerary, which includes all transfers, dining and optional four-star overnight accommodation at Whittlebury Hall Hotel, was curated by racing hospitality expert, Rachel Moroney, who has spent two decades managing hospitality and tour programmes for Formula 1 and Sportscars. The programme builds on Motorsport Live’s burgeoning reputation for designing and delivering the very best fan-centric motorsport experiences.